In what scientists are calling miraculous, motorcyclists can actually get a flu virus via the internet. You read it right. This is not your ordinary file system virus, the virus is bacteria borne and can be passed from one user to another electrostatically. Here’s how it works. 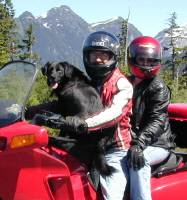 The H2-DNR6 is a bacterial virus that is prevalent in dogs and can only be transmitted from dogs to humans when both the dog and human are near the exhaust system of a motorcycle. The motorcycle exhaust allows the virus exhaled from the dog to propagate itself into the human rider or passenger and the virus enters the human through the lungs by breathing in both exhaust fumes and the dog's breathe at the same time. So far that would seem a rarity and few riders would ever have to be concerned. But the next thing that happens is a first and would not have been possible before the age of the internet and home computer. The virus is the first such virus to be able to be transmitted to other humans electrostatically. Motorcyclists that get infected with the virus and have computers using AMD processors can pass the virus to other humans using similar computers running on the AMD processor platform. If the rider's breath reaches the processor, the chip will short circuit momentarily causing a series of algorithms and binary sequences to occur. The final sequence then gets transmitted in an email. When an email containing the binary sequence is sent to another user with a similar AMD processor chip, the email arrives and the binary code triggers the processor to short circuit momentarily. At that point a minute electrical fire occurs on the motherboard causing a discharge of noxious fumes from the board. And the sequence in which the discharge occurs reforms the flu virus and releases it into the air around the computer. Should the user be nearby, they can inhale the fumes and become infected with the H2-DNR6 virus almost unknowingly. The only tell-tale sign would be the smell of the fumes and by then it is too late. "This is both scary and fascinating at the same time," comments US technology adviser Julius Genachowski. "Never in my wildest dreams did I think that I would have to interface with the Surgeon General on a situation like this." When a human is infected with the virus they can feel flu like symptoms making it unsafe to ride. Dogs infected with the virus tend to sleep up to 20 hours per day. The symptoms can last up to six months. So far the virus has only been reported in Washington, Oregon and Idaho. AMD has yet to do a recall and it’s too soon to know just how many units are affected by this scenario. A two minute video has been produced jointly by the MIC, FCC and FDA to assist riders with preventing infection of the virus. CLICK HERE to watch the video now.